NEW YORK—In the realm of play, what is not real becomes real, what is not serious becomes important. The objects that Samuel Hung chooses to paint may seem trivial, but he is elevating them to a higher status—as if dubbing them ambassadors of happiness. One would have to be terribly bitter not to smile at the site of a yellow duck, that iconic childhood bath toy; or Kewpie, the mascot for Japan’s first mayonnaise; or a Tonka truck. “I find unimportant things interesting, like these toys. They can be easily overlooked, but they are important to somebody—they are important to kids,” Hung said at Grand Central Atelier where he works as an artist in residence. 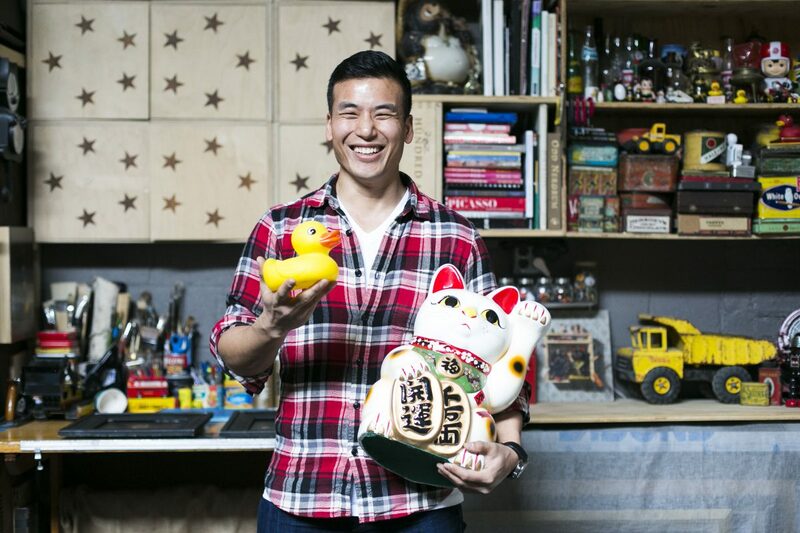 Even before the birth of his 2-year-old son, Hung started painting toys and company mascots that have seeped into our daily lives. He contributes to their cultural currency, using the high technical skills of 19th century French Academy painters. He can paint objects with such accuracy that they look more real than the real thing. Those are the rules of the game he chooses to play by: to always paint realistically, but without the use of photographs; and despite the struggle of trying to get it right, to always put his heart into it. His paintings then invite the viewer to play a game of visual perception. He riffs on the American or Dutch trompe l’oeil tradition, but full of pop culture wit. He touched up a drawing, a study for his next painting, of a Kewpie doll holding in its hand a piece of corn candy. 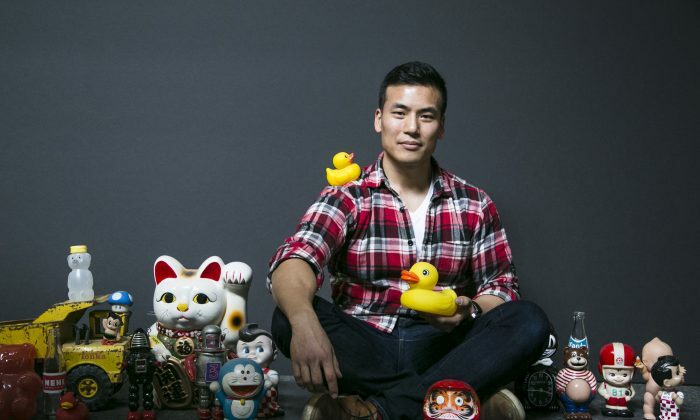 The doll stands towering over two little rubber ducks, a Japanese Daruma head, and three more pieces of corn candy. While painting, Hung placed his eye level, and consequently that of the viewer’s, slightly below that of the doll, which gives it a kind of cute mischievous sense of superiority. “There’s an internal dialogue that I have about my paintings, but I would rather not say what it is because I feel that would limit the experience for the viewer,” he said. 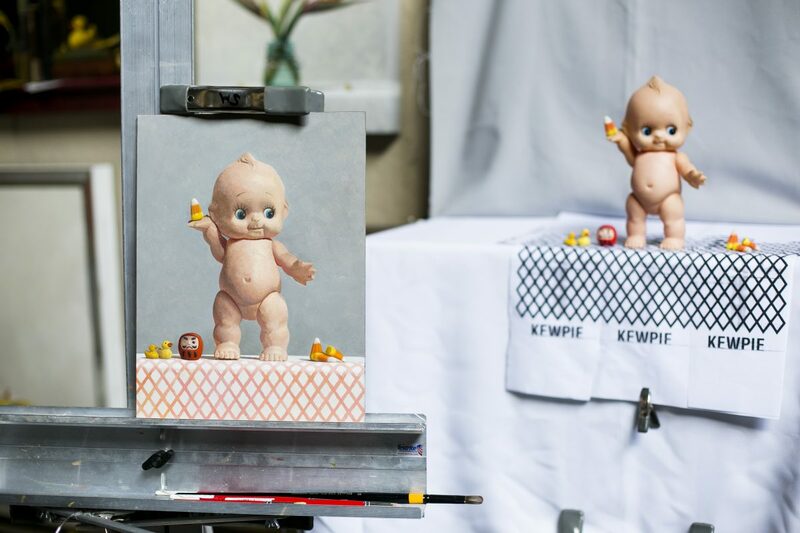 He did a drawing to study the form of the Kewpie doll and a preparatory painting as a color study to develop the feeling that he wants to evoke. He was still deciding on the size he wants to make the final painting. There’s something more to these household objects just being cute or playful. “It’s intriguing,” he said. “Why did something that is kind of meaningless become this iconic thing?” he asked rhetorically. Some of these iconic figures travel across borders and are assimilated into different cultures, sometimes attaining international status more easily than humans. Kewpie, for example, was inspired by cupid and conceived for a comic strip in 1909 by an American illustrator, Rose O’Neil. Three years later, it was produced as bisque dolls in Germany. In 1925 a Japanese food company started to produce mayonnaise and adopted Kewpie as its mascot and name. Later in the 1950s the first plastic versions were manufactured. Today the originals, signed by O’Neil, cost thousands of dollars. 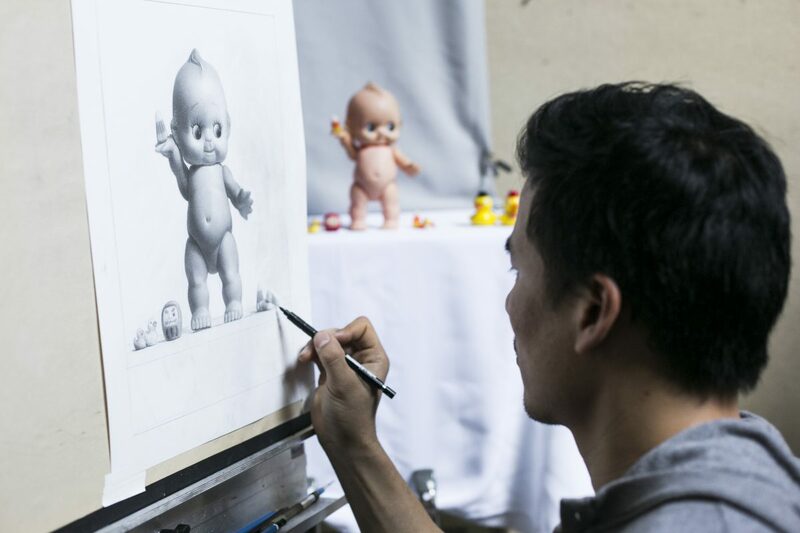 Hung plans to paint a baby boy doll, Tatung Baobao. It wears an American football jersey and holds an American football, but it’s the mascot for a Taiwanese rice cooker. “Everyone in Taiwan knows what that is. They grew up with home cooked meals made with this rice cooker,” Hung said while showing a small toy model of the rice cooker. 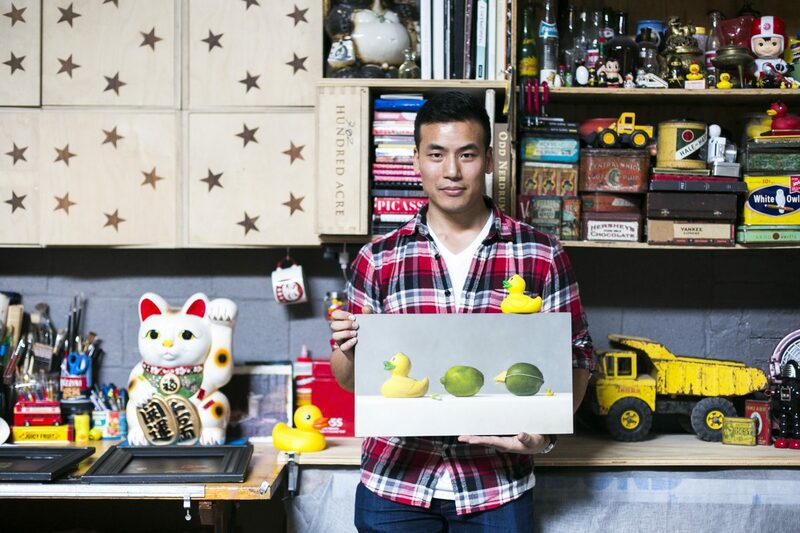 A shelf full of stuff from different shops and flea markets stood in the corner of Hung’s studio space. 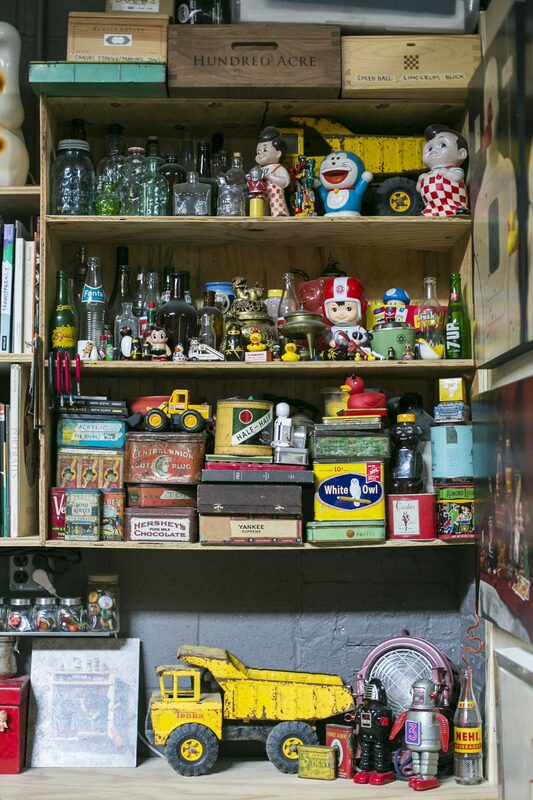 “I think the reason I collect these things is because they are familiar and comforting to me. They are also a piece of culture that I want to connect with for myself,” he said. Hung was born in Taiwan. His family moved to the United States when he was 4 years old, first to Monterey Park and later to Arcadia, about 10 miles from downtown Los Angeles. He enjoyed drawing and painting as a child and his parents hired a tutor to teach him art once a week. He yearned to draw as good as the illustrator, N.C. Wyeth. His father was a nuclear engineer, who was invited by his American boss to work in the United States. But shortly after the family immigrated, his father’s boss had to retire after suffering from a heart attack. Hung’s father was left without work in his field. Like many hardworking immigrants, Hung’s parents suddenly had to start from scratch. Hung still speaks Mandarin and Taiwanese and mixes in a few random English words when he speaks with his family. After finishing his bachelor of fine arts (BFA) in illustration, he went back to Taiwan to live with his older brother for a year to reconnect with his roots, but realized he was ambivalent. “There was something I could never get. I guess there was no way I was going to be Taiwanese. Deep down, I knew I wasn’t going to fit in,” he said. Taipei gave Hung a taste of urban life that was livelier than his suburban California upbringing, and it inspired him to move to New York City, where at first, just riding the subway felt like an adventure. He did various random jobs including an art-related job for a company that copied and mass-produced artwork to decorate big corporations, and places like hotels, banks, and cruise ships. “It ended up sucking the life out of me,” Hung said. “That year was a really unhappy dark period because I was doing something that was meaningless in my life just to make money,” he added. He quit that job. Feeling gross about that experience, he completely gave up drawing and painting and started working full time as a trainer at an Equinox Fitness Club to make ends meet. Still, fate would have it that Hung would discover the place where he could learn the skills to excel as the kind of fine art painter that he had yearned to be when he was a child. 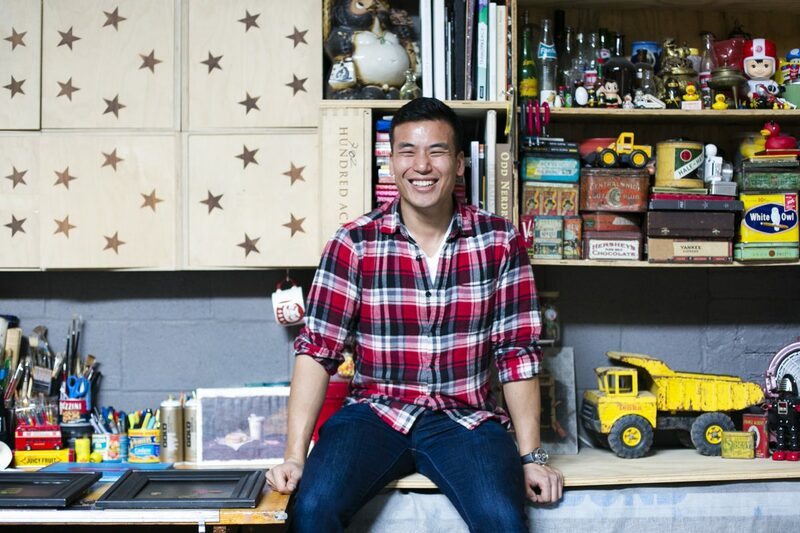 One of Hung’s personal fitness clients eventually saw some of his artwork and encouraged him to meet a friend, Jacob Collins—the artist and founder of Grand Central Atelier. Hung then looked up Collins’s work. “I was blown away and instantly he became my hero,” Hung said. “Collins showed me people doing cast drawings, cast paintings, and figure paintings and I was just really blown away that people today were doing this type of work at that level, and it wasn’t just one person, it was 30 or 40 people,” Hung said recalling his first visit to the atelier, which continues to train artists in the orderly tradition of the old masters. That was exactly what he wanted to do, and so he started with its summer intensive doing one cast drawing for a whole month and after that he started the core program. Although Hung’s BFA studies in illustration at the Art Center College of Design in Pasadena, California, were good, he said, “Before, I could never make something as real as I wanted to make it. I was just copying, like ‘monkey see, monkey do,’ but now at Grand Central I am actually doing something more. The artists here are digging deeper,” Hung said. While all of the students at the atelier learn the same techniques, once they finish the core program they start developing their own distinct visions. For Hung the transition after his studies progressed naturally, especially in terms of subject matter. “I was always interested in playful iconic objects. Gummy bears were the first paintings I did when I was in college back in 2003. That was the direction I wanted to take.” At Grand Central he felt an affinity with artist and teacher, Tony Curanaj. “He was a big influence on my work, both in terms of subject matter and technique. I didn’t use to work as tight or at the pace I work now,” he said. His first gummy bear painting only took a day to finish, now a study drawing can take him longer than a week, and it’s incomparably more evocative. He’s very thankful to be at the atelier where artists and students, who share similar challenges, encourage and inspire each other to become genuinely amazing artists. Samuel Hung’s work has shown at the Gallery Henoch, and his current work will be included in a group show at Eleventh Street Arts in Long Island City, opening on April 15. “This Is New York” is a feature series that delves into the lives of inspiring individuals in New York City. See all our TINYs here: epochtim.es/TINY or follow @milenejf on Instagram.